The move, they said, is in response to the ongoing challenge faced by individuals to fund higher education, especially at the postgraduate level. The loan is available to new and/or returning students enrolled in the MSBM's master of business administration, master of business management, master of science, and doctoral programmes. JMMB Bank general manager for client partnership, Moya Leiba-Barnes, provided details. “This unsecured loan facility will offer MSBM graduate students up to $5.2 million toward their tuition, with a flexible loan repayment plan. With this loan, students have the option to pay their tuition upfront or in up to three tranches, in line with the school's payment schedule and/or their own convenience. This has the benefit of making repayment more affordable, since interest is only applicable on the amount paid over to the institution,” she explained. The loan amount provided is dependent on the tuition cost of the student's programme and the amount for which he/she is qualifies, based on other financial obligations. Students will have up to five years to repay at an interest rate of 15 per cent. They will also be required to pay a processing fee, starting at 1.5 per cent, but the bank stressed that there is no penalty for early repayment or foregoing use of a part of the loan amount approved. “We believe that this innovative approach creates an opportunity for individuals to better manage their finances and forego the burden of high-interest debt, thereby allowing them to achieve their goal of a higher education and other future goals such as home ownership and wealth accumulation,” Leiba-Barnes said. 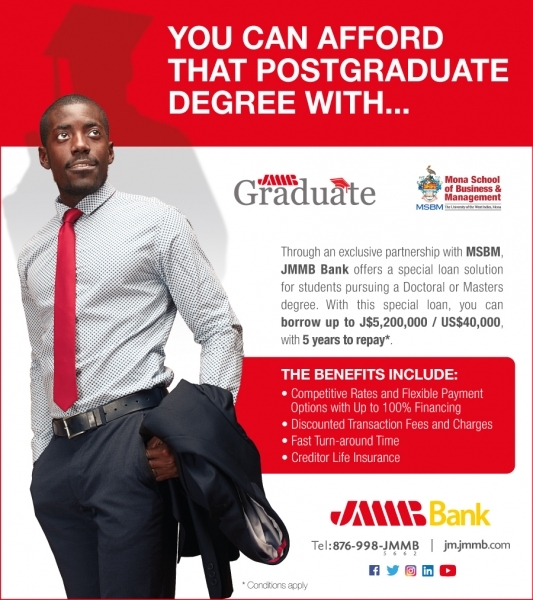 Dr David McBean, executive director of MSBM, welcomed the partnership with JMMB Bank, notinsg that “the decision to pursue graduate studies is an investment”.